When I make Twice Baked Potatoes, I like to make a lot and stick them in the freezer. They are great to have in the freezer for lunch or even an easy dinner. As you can see in the picture, I forgot to save some cheese so sprinkle on top. They were still super cheesy and delicious without the extra sprinkle of cheese. Preheat oven to 400°F. Poke several holes in the potatoes with a fork and place on a baking sheet. Bake until very tender, about 1 hour and 15 minutes. Cool slightly before scooping out the insides. Brown the bacon in a skillet over medium/high heat. Drain on paper towels. Combine butter, bacon and sour cream in a very large bowl. Once the potatoes are cool enough to touch, cut them in half lengthwise. Scoop out the insides, leaving a potato skin shell. Leave a little attached to the skin for some stability. Put the potato insides in the bowl with the butter. Mash the potatoes together with the butter, bacon and sour cream. A potato masher works well for this. Stir in 2 cups cheese and green onions. Season to taste with salt and pepper. 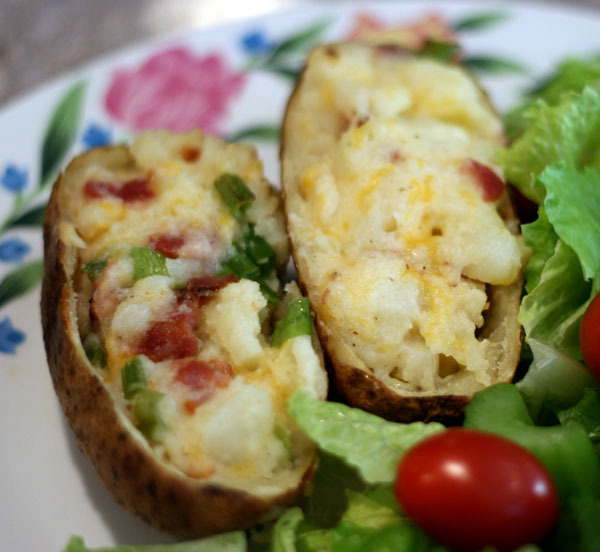 Spoon the potato mixture into the potato skin shells. Top with remaining cheese. Bake at 350°F until warm and bubbly, about 15-20 minutes. These can also be frozen in a zip top bag. Baking time will be longer for frozen potatoes.